Confidence is NOT going into a situation knowing it’s going to go well. It’s knowing you’re going to be fine no matter what happens. Once you’re not longer scared of the worst thing that can happen, that’s when you relax. You’re less tense, you enjoy yourself and you naturally come across as more confident. This is one of the key points Ciaran Callam and I will try to drive into you in our upcoming digital course 4 Weeks To Unstoppable Confidence. The course features designed to push you out of your comfort zone every day, at a pace that’s manageable, no matter how shy or introverted you are. At the same time, it’s challenging enough to change you as a person and help you release your super-charismatic self. No matter what level of confidence you consider yourself to be at, this 28-day challenge will help you gain the confidence to live your best life. Ciaran and I want those who regularly consume our content to get the course as cheaply as possible. 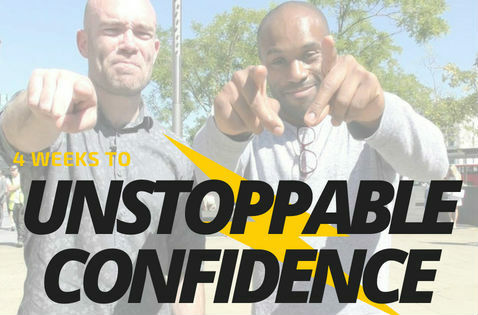 To get the course as cheap as possible, click the links at www.4weekconfidence.com. Here are some clips from the course. mighty @ciarancallam for our upcoming digital product ‘4 Weeks To Unstoppable Confidence’.